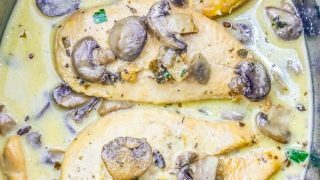 Easy One Pot Slow Cooker Creamy Chicken Marsala is a hearty, delicious low carb chicken dinner – perfect for keto diet and paleo diet meal prep! A deliciously indulgent dinner the whole family will love – great on its own or served with pasta, rice, grilled vegetables, or even a baked potato! When I was in college, Chicken Marsala was a dish I made again and again for my roommates. I picked up a recipe from one of the marathon Food Network binges I’d embark on (see mom and dad? I *am* using something I learned in college… haha) – it quickly became my go-to recipe, but I burned out on making it pretty fast. I haven’t made chicken marsala in ages – and recently got the urge to make my old standby favorite again, but this time with a little bit of a new twist, by making it simple and even easier and cooking it in a slow cooker! This easy low carb slow cooker chicken marsala is rich, hearty, and bursting with flavor – and is so incredibly easy. 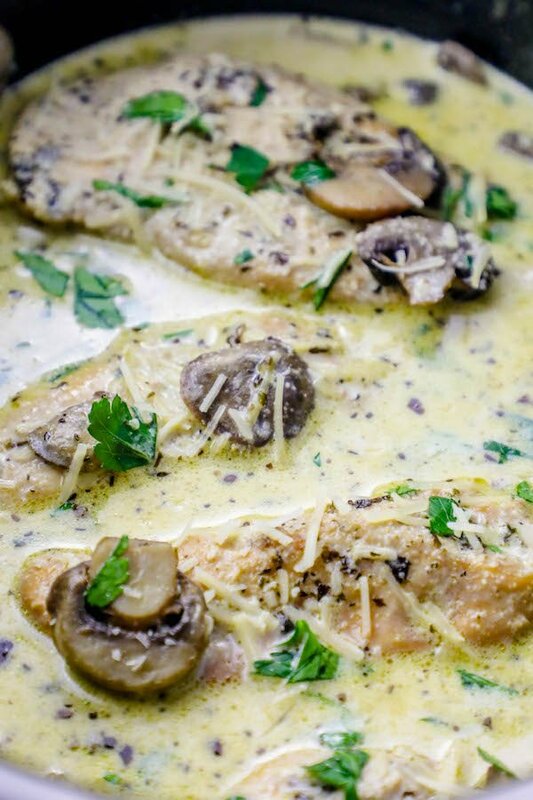 Just Take Me To The Easy Low Carb Slow Cooker Creamy Chicken Marsala Recipe Already! 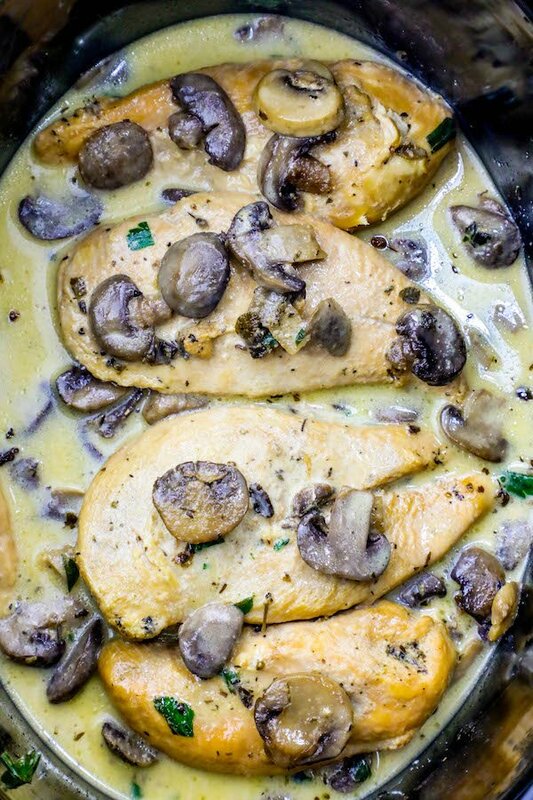 If you’d like to skip my helpful tips and tricks and similar keto chicken dinner recipe ideas – or what to serve with this slow cooker chicken marsala recipe – please scroll to the bottom of the page where you will find the printable recipe, just above the comments. I get a lot of comments and questions on my recipes and requests for similar dishes or side dishes to serve with this chicken marsala recipe, so I try to provide as much information as possible. This recipe is as easy as dump in a crock pot and cook your way to an easy keto chicken diner, but a couple tips and tricks will help you get perfect results every time! This recipe doesn’t call for browning the chicken so it can be the easiest possible – but if I have enough time, I will brown my chicken breasts on each side (sautee on medium high in 2 tbsp olive oil – about 3 minutes per side until chicken is golden brown but not cooked through) and then place them in the slow cooker. Browning chicken breasts before adding them to the slow cooker will increase the chicken’s buttery rich flavor without adding calories. A little caramelization helps increase the mushroom’s flavor a ton in this marsala recipe, so I brown the mushrooms in a little butter for just a few moments before adding them in the slow cooker and following the directions below. -Whisk sauce well before cooking to reduce again. When adding cream, remove the chicken so you can whisk it vigorously to blend into a creamy marsala sauce. Whisking the cream into the sauce will help it not break and separate from the cream. While removing the chicken from the slow cooker and whisking cream in to dish isn’t strictly necessary, it will make your sauce smoother and less likely to separate, so I do recommend doing it. If you love this easy keto chicken dinner recipe, you’ll love these other easy slow cooker dinners! This keto slow cooker chicken marsala recipe is delicious without any special skills or equipment, just tools you probably already have in your kitchen! 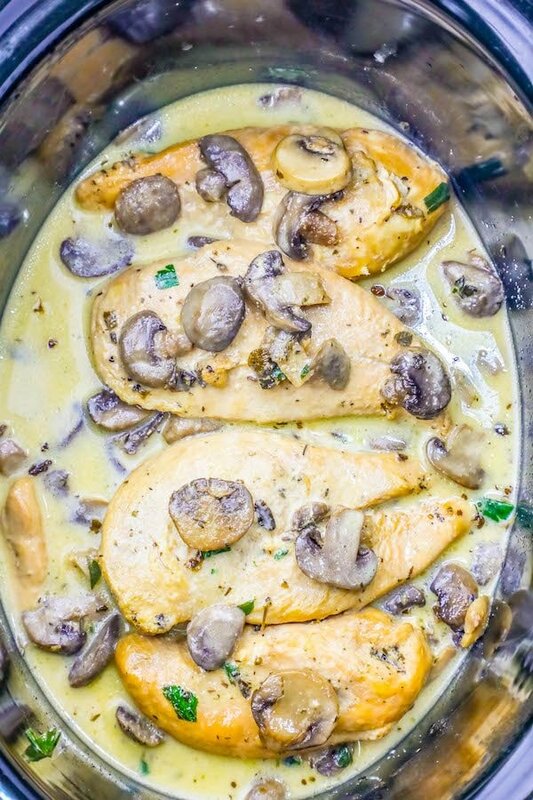 If you love this keto slow cooker creamy chicken marsala recipe as much as I do, please write a five star review, and be sure to help me share on facebook and pinterest! Easy One Pot Slow Cooker Creamy Chicken Marsala is a hearty, delicious low carb chicken dinner - perfect for keto diet and paleo diet meal prep! A deliciously indulgent dinner the whole family will love - great on its own or served with pasta, rice, grilled vegetables, or even a baked potato! Add oil to slow cooker and spread around the base. Add chicken to bottom of slow cooker. Layer mushrooms and seasonings on top, and pour wine over the top. Add lid to slow cooker and cook on high for 3-4 hours (depending on your slow cooker - they can vary wildly) until chicken is 155 degrees internal temperature. Remove chicken and mushrooms from slow cooker, set aside. Stir in cream and whisk vigorously until thickened. Add chicken and mushrooms back to slow cooker, add lid, and cook another 20-30 minutes, until chicken is 165 degrees internal temperature. 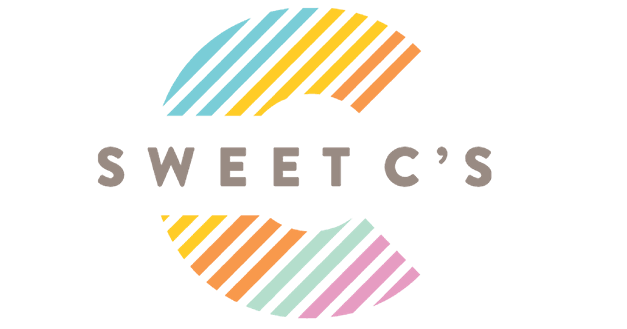 I am new to keto meals and have been eating very basic.This sounds amazing can’t wait to try.I am also trying the keto crack chicken.sounds fantastic!!!! That keto crackle chicken is the BEST! The marsala chicken is tasty, but the crackle chicken…. holy moly. You won’t be disappointed! If I need to put this in the slow cooker before work can I cook it on low for 8 hours or so instead? I don’t have wine on hand what else can I use? Chicken stock will be just fine – although you won’t have a marsala flavor. Do you use fresh or canned mushrooms in this recipe? I prefer fresh, but if you only had canned on hand you could try them out too. Make sure it’s a canned mushroom you love the flavor of!